PLEASE NOTE DURING NOV 1, 2018 TO APR 30, 2019 THE PROPERTY IS SELF-CHECKIN AND KITCHEN IS CLOSED FOR THE LOW SEASON THEREFORE NO BREAKFAST SERVED. 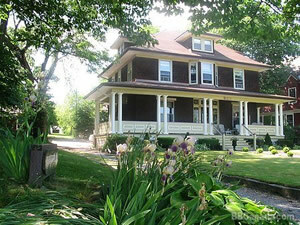 ONLY B&B IN NIAGARA FALLS RECOMMENDED IN BEST PLACES TO B&B IN ONTARIO BY JANET HIGGIGNS. Lion's Head has a rich and interesting history. It was built in 1910 by local architect, J.A. Phillips for Hugh Wilson, Superintendent of the Toronto Electric Corporation. The historical fact that Lion's Head was the first poured foundation home in the Niagara Region, allows it today to remain one of the few homes that is completely orginal and restoration has not been required. A fabulous location on Niagara's most scenic drive offering unparalleled views of the spectacular Niagara River Gorge and a leisurely 10 minute stroll to the Falls, Casino and other major attractions. Enjoy the culinary skills of the innkeeper, Helena, whose experience in the kitchens of Canada and Britain, make the breakfasts at Lion's Head renowned . The interior of Lion's Head offers an eclectic mix which is reflected in the guest rooms which are named after artists. The use of colour and decorative accents give off a dramatic flair. Sit down on the large wrap-around porch with a glass of wine and listen to the roar of the mighty falls! Tea, coffe and breakfast is served daily at 9:00 am each morning in the formal dinning room which overlooks the Niagara Gorge. Sit down, relax and enjoy the company and chat.